The Best 50 Years: How Do You Want to be Remembered? Remembered fondly, missed a bunch! Have you thought about how you want to be remembered? If you're under 50, this probably hasn't even crossed your mind. But if you're anywhere in the second half, even if you've just barely hit the 50-year mark, you need to start considering the types of memories you're creating for the people around you each and every day. And the further you are on the plus side of 50, the more serious you need to be. Unless, of course, you don't care how you're remembered. If that's truly the case, you can quit reading now. I've been giving this a lot of thought lately. After all, the older I get, the older others get, as well - so I now have numerous examples to follow (or not) just one generation up. Yikes! Does that mean I'm nearly old? Hmm. One woman particularly sticks out in my mind as someone to emulate. Although she is no longer with us, Mavis lives on in the memories of friends and family as a woman who loved life and brought joy to those who knew her. 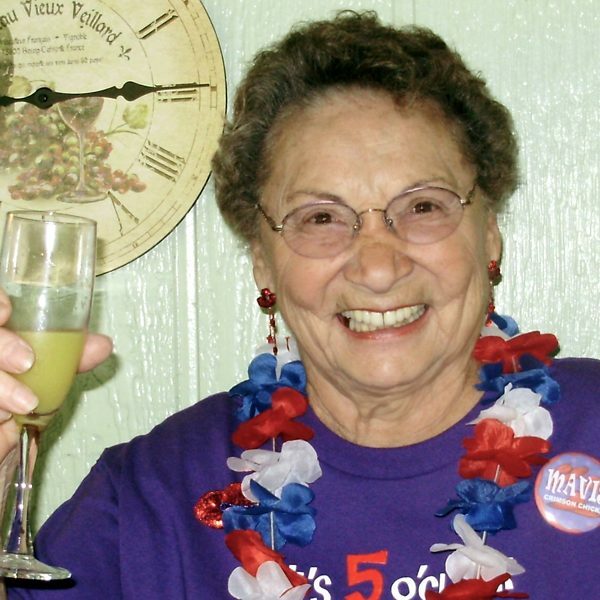 A ready smile and kind words were Mavis' hallmark. What a way to be remembered! Where do I sign up for that? Oh yeah - with my actions. Always remember that memories are generated from experiences, not words. Don't expect to be remembered for what you say, expect to be remembered for your actions and how they affect others. If you want folks to remember nice things about you, give them something nice to remember! And this isn't just for after you're gone from this life - it applies every day that you're still here, as well. How Do You Use Your Idle Time?